With your support horror comics will be back! 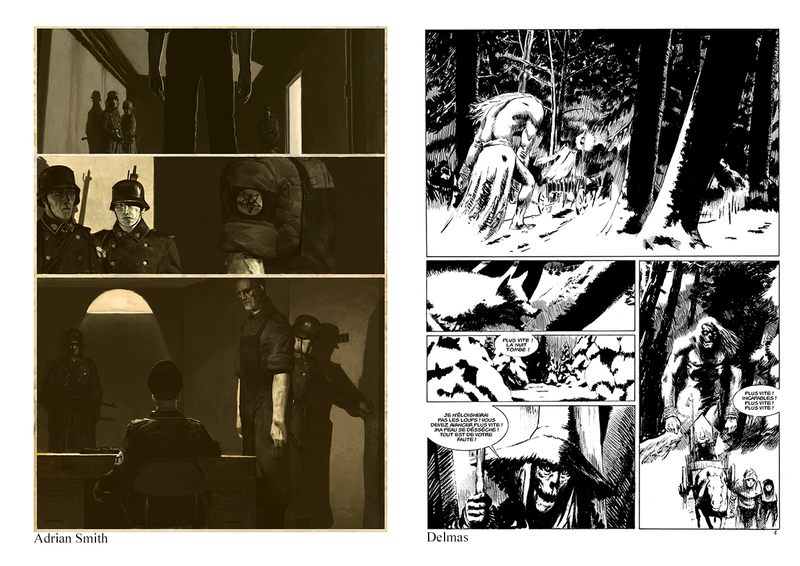 Help us fund this anthology of creepy comics and dark novellas. 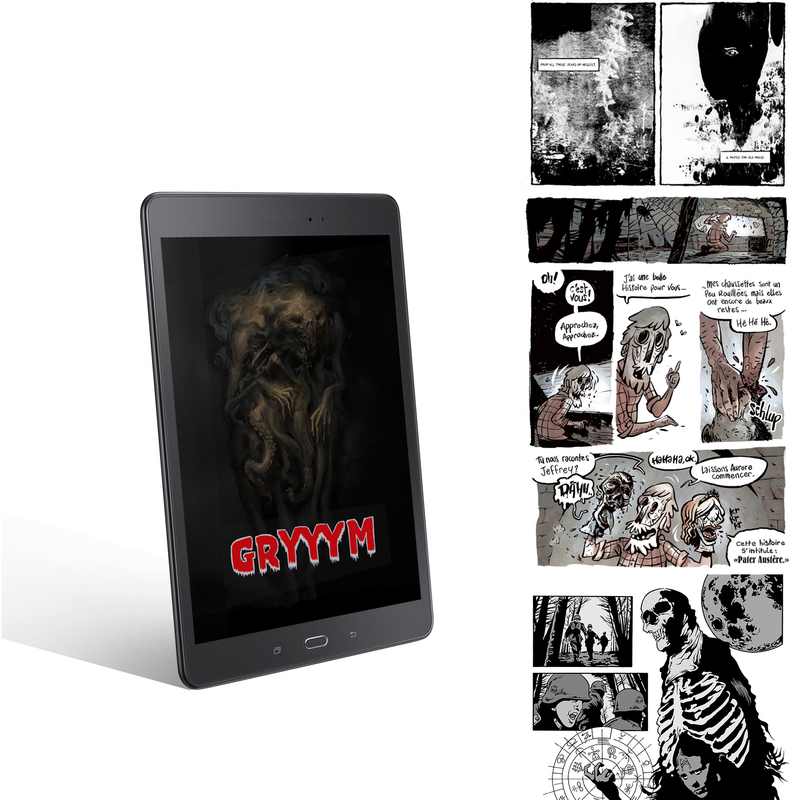 Gryyym is a collection of fantastic and horrific stories in the form of short comics and illustrated novellas. 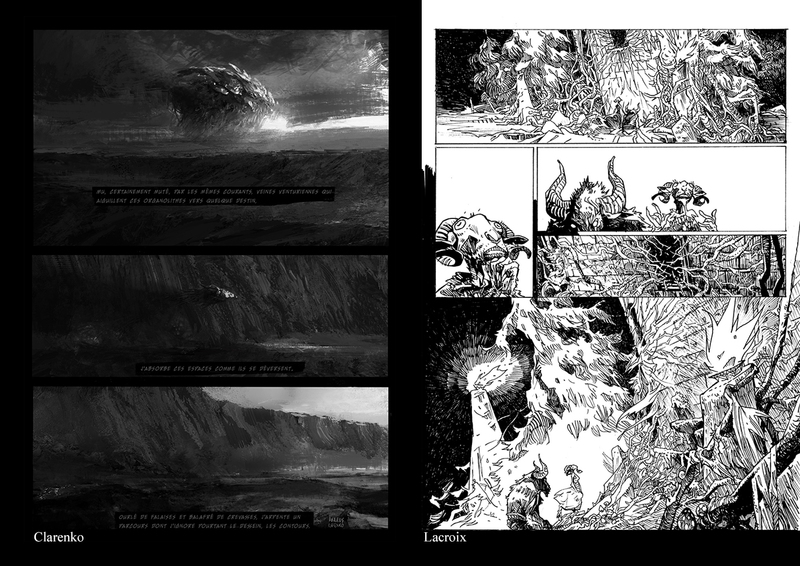 The size of the book will be 21 x 28 cm, the total number of pages and the binding will depend on you backers! Our wish is that each artist gets paid (at least a little) and we've got a lot artists for you starting at the first stage. This is why we decided to make this project through crowdfunding on KissKissBankBank. 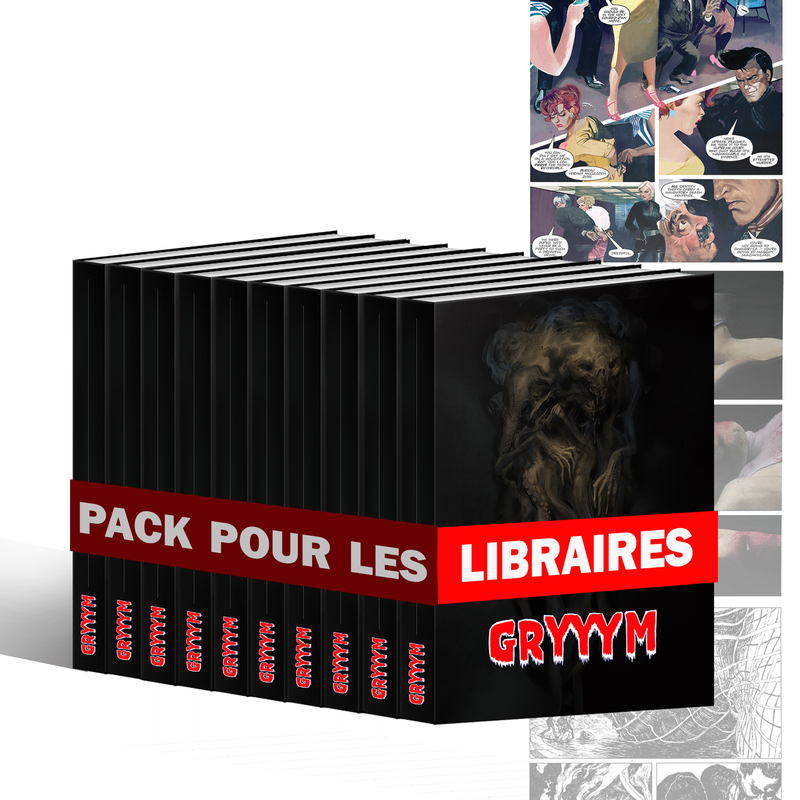 GRYYYM WILL BE PUBLISHED IN FRENCH AND IN ENGLISH ! Adrian Smith with an incredible original 10-pages comics! Adrian Smith impressed us with his powerful comics Chronicles of Hate published by Image in 2014. To say the least, we would be proud to see him add his visionary genius to the dark pages of Gryyym. David Lloyd one of the masters of classic noir storytelling, whom the whole planet knows for the mask of the Anonymous. But let's not forget this mask comes from his cult graphic novel V for Vendetta. Having him in Gryyym means the world to us and we hope for you too! Tommy Lee Edwards and Richard Marazano joins the party with a dark tale of Vampires in South American jungles. Tommy is an incredible artist with an inimitable style. His comics for Marvel & DC, as well as his work in the movie industry has left many of us speechless! Pat Mills & Fay Dalton, the grinning father of Judge Dredd and forefather of UK comics is illuminated by the beautiful painted pages of Fay Dalton! God saves the Gryyym! Painted by Attila Futaki and written by Gabriel Delmas, twenty pages of exceptional hyper-realistic watercolours in the service of an oppressive story of paranoid delirium. Followed by Gabriel Delmas alone with a tale of a mushroom man and a giant lost in the snow; did you say "obsession”? The rest of his evil work does not deny it. Jean-Paul Krassinsky, a virtuoso comic artist who juggles with graphic styles, gives us a short squeaky story or simply funny and crazy, or maybe all at once. Joseph Lacroix has been digging into the lands of dark fantasy since his childhood, and he delivers for Gryyym the substantial marrow of the genre. 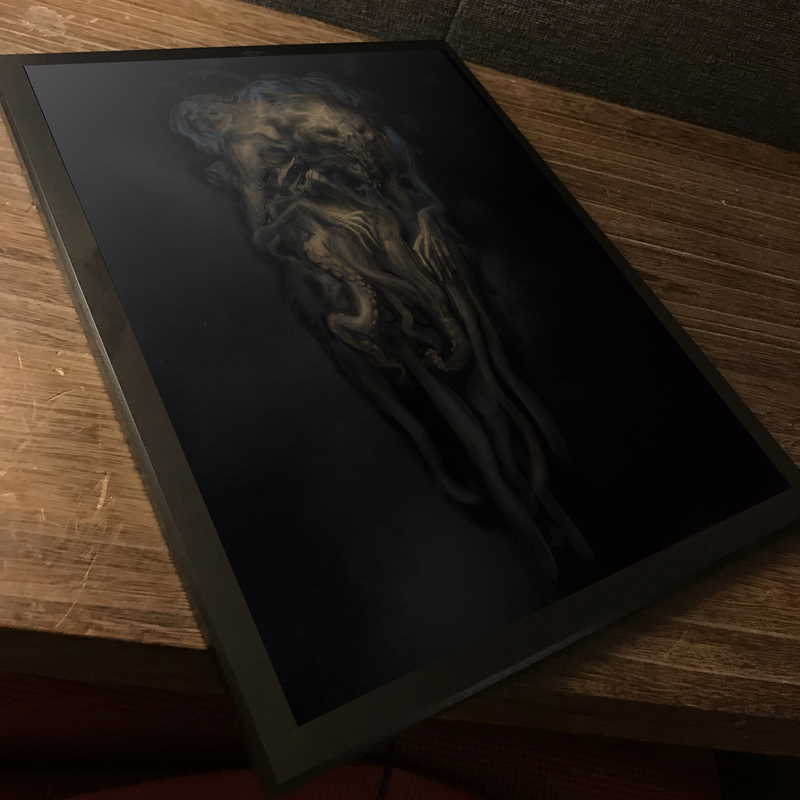 Patrick Pion that you discovered with Chrome at the beginning of this century, and who continues to draw monsters and undead, tentacles and worrying holes on cursed lovecraftian pages. 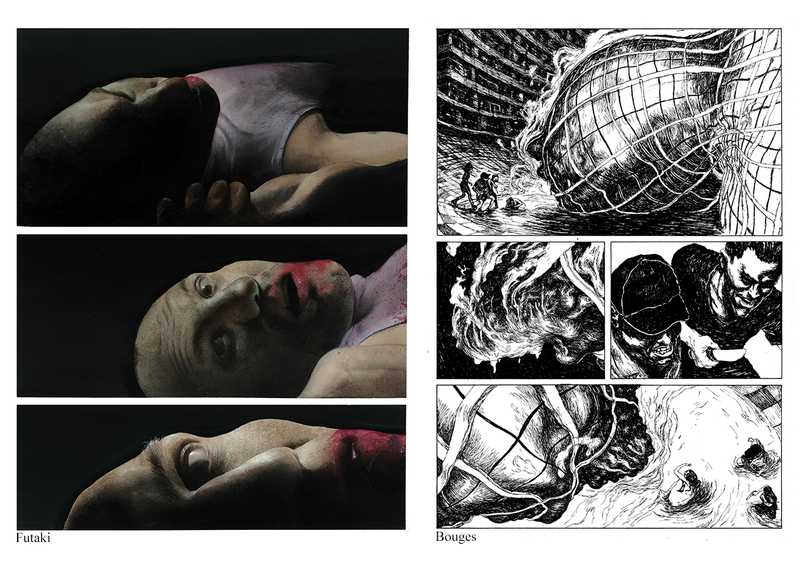 You will also discover Guillaume Bouges, of whom we are happy to publish one of the first comics, George Clarenko & Akileus, Chris Lenté, Jurictus, an hallucinating artist published by Le Dernier Cri. It's essential to us that they're all part of Gryyym! Illustrated short-stories we said? Here they are! Richard Marazano illustrated by himself for a science fiction short story. Chrysostome Gourio illustrated by Bruno Letizia in the tradition of the Tales of Crypt horror stories. You didn't think we'd stop there? Julien Brunet's drawing will cover the endpapers with endless grinning skeletons! Alkbazz and Julien Gardon will illuminate the book with their nightmarish miniatures. And our last guest star is the international brush magician Nicolas Nemiri who'll draw an original illustration on the title page of our compendium! The second stretch goal at 17,000 euros will thrill you with an incredible original novella by Sabrina Calvo, Grand Prix de l'Imaginaire 2018 and Rosny Ainé 2018 Award for her fascinating novel Toxoplasma, illustrated by Peggy Ann Mourot (who has already illustrated Sabrina Calvo's novel at La Volte). The duo is preparing a dark and extravagant vision of which they have the secret! Not to be missed under any circumstances! If we reach this level thanks to your tremendous support, all contributors will receive a 12-page collector mini-comics, printed separately. The backstages of Gryyym, its adventures and anecdotes by THE Grégory Maklès! This second level will certainly make a name for itself! 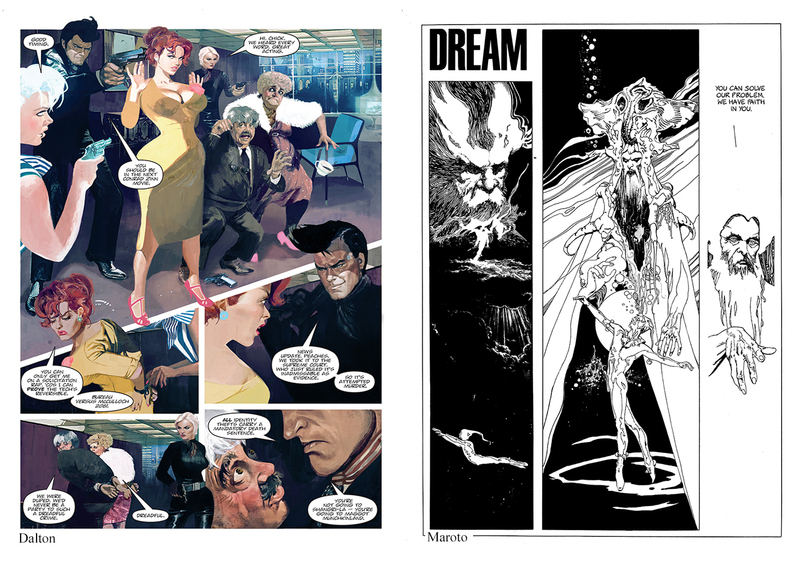 The third stretch goal at 20,000 euros will add 22 pages of original comics by two of the most brilliant Italian artists of their generation: Elena Guidolin and Paolo Massagli. Plastic artist and comic book author, often in self-publishing, Elena Guidolin combines the elegance of drawing with dark and mysterious stories and inventive staging. Paolo Massagli, famous for his horror and science fiction comics published by Hollow Press, is an extraordinary illustrator of witches and aliens with voluptuous and rotting forms. Gryyym will give you the opportunity to discover their talents! 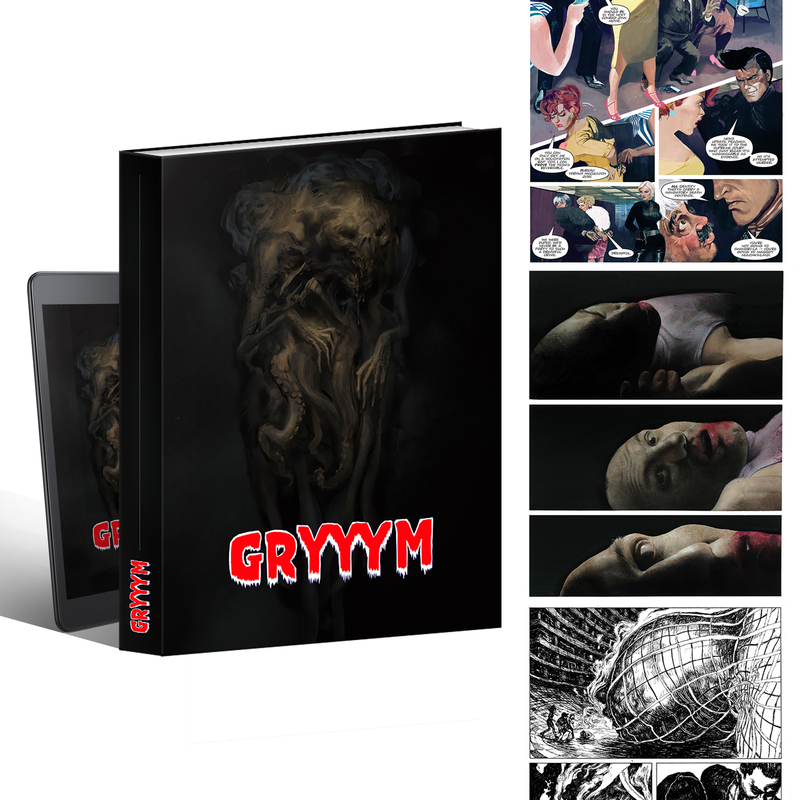 With the fourth stretch goal at 23,000 euros, Gryyym will be printed in hardcover and the interior paper goes up to 150 grams for a more luxurious edition and even more reading comfort. Gryyym becomes this magnificent collector's collection in your library! And more! The incredible Fay Dalton will be painting an original new cover for Gryyym! The fifth stretch goal at 27,000 euros is classic and classy. Esteban Maroto joins Gryyym with a fabulous story of myth and magic. Esteban Maroto was one of the pillars of Warren Publishing, one of the cult artists from Creepy, Eerie and the rest of the 70's horror magazines. Having be on board is fulfilling Gryyym's prophecy. All the contributors will also receive a folded three-part print on 240 gram art paper with a drawing of Gabriel Delmas, Joseph Lacroix and Gregory Maklès. The sixth stretch goal at 30,000 euros gets you 4 new original comics by Franck Biancarelli, Olivier Bramanti, Guillaume Chuffart et Vincent Pelletier, Tanguy Ferrand and Renz. An additional 30 pages! And what a treat! Olivier Bramanti is a rare artist, a painter and draftsman published by Frémok no less. Franck Biancarelli will get you with his realistic drawing inspired by classic comics. Guillaume Chuffart's drawing is more in a humorous vein, but who said that black humour had no place among us? Tanguy Ferrand and Renz have cooked for you a dark and political story with a resolutely modern tone. Eclecticism is also one of Gryyym's qualities! The seventh stretch goal at 34,000 euros is “Eternal Champion” crazy! The legendary Michael Moorcock joins us with an original Jerry Cornelius short-story. From Elric of Melniboné to Breakfast in the ruins Michael Moorcock has revolutionized Science-Fiction and Fantasy with his hallucinated visions! So be ready! Gryyym also gets an additional 4 endpapers with the delirious skeletons and other evil creatures by Julien Brunet. The eighth stretch goal at 38,000 euros is a challenge. Whose vision & art would be powerful enough to illustrate Michael Moorcock? The one and only Ashley Wood! From Popbot to 3A Ashley Wood is one of the graphic genius of this century! 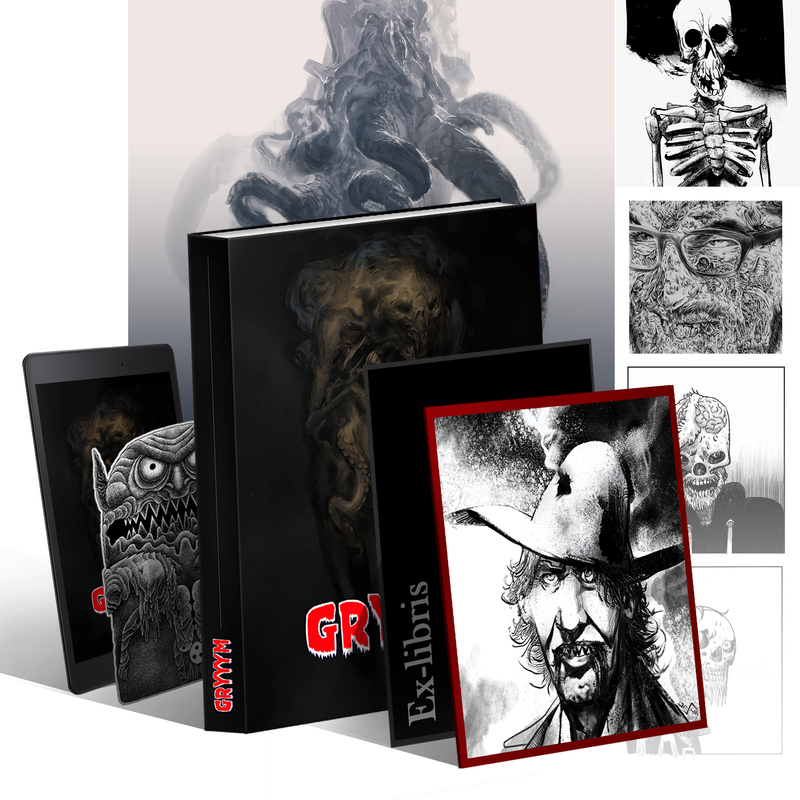 For the ninth stretch goal at 41,000 euros, Pat Mills comes back with a new comics illustrated by Grégory Maklès. The tenth stretch goal at 44,000 euros will get you a terrifying story by Frazer Irving, no less! For the eleventh stretch goal at 47,000 euros, monsters will bite your book. A delicate and terrifying embossing of the cover will greet your book with a reminder of those which lurk below. And that's it! 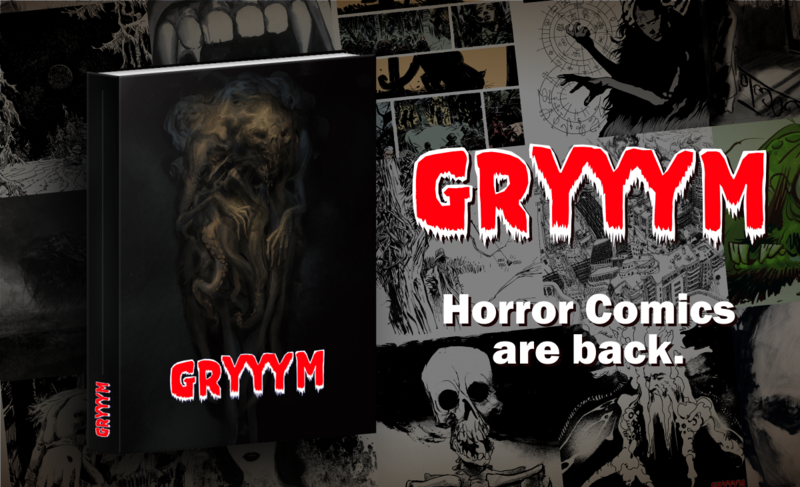 Gryyym collects over 200 pages of horror and fantasy! Thanks! 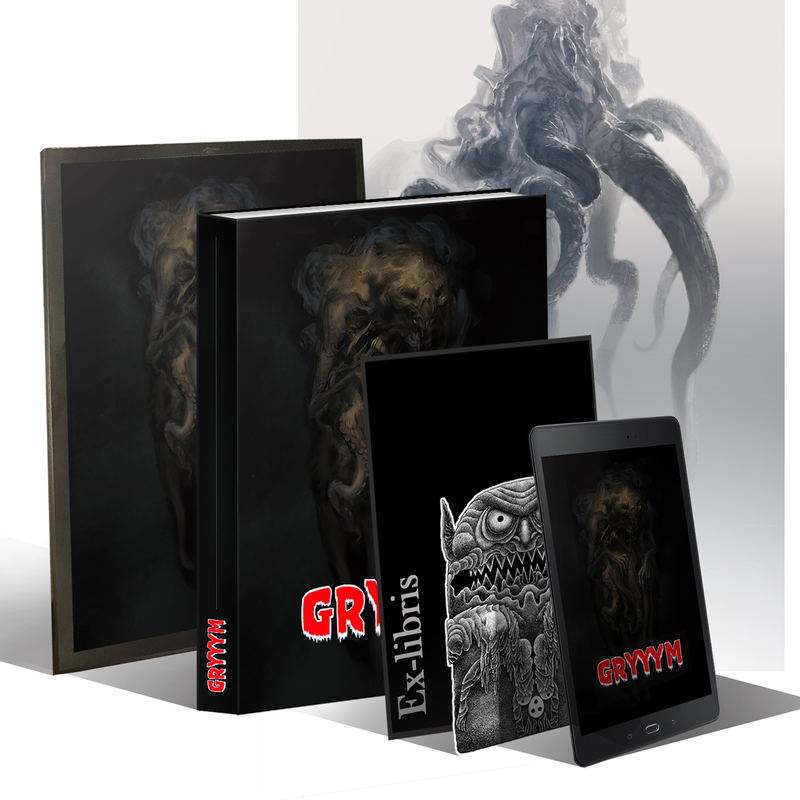 Gryyym will offer a wide variety of graphic styles, focusing on terrific art and extraordinary stories in the tradition of Creepy, Eerie, Made in USA, Heavy Metal, 2000 A.D. and Métal Hurlant. We believe that this kind of collective laboratory in the service of imagination and entertainment cannot be find today in the field of horror and dread. We want it to be printed in November 2019 and to reach 200 pages! 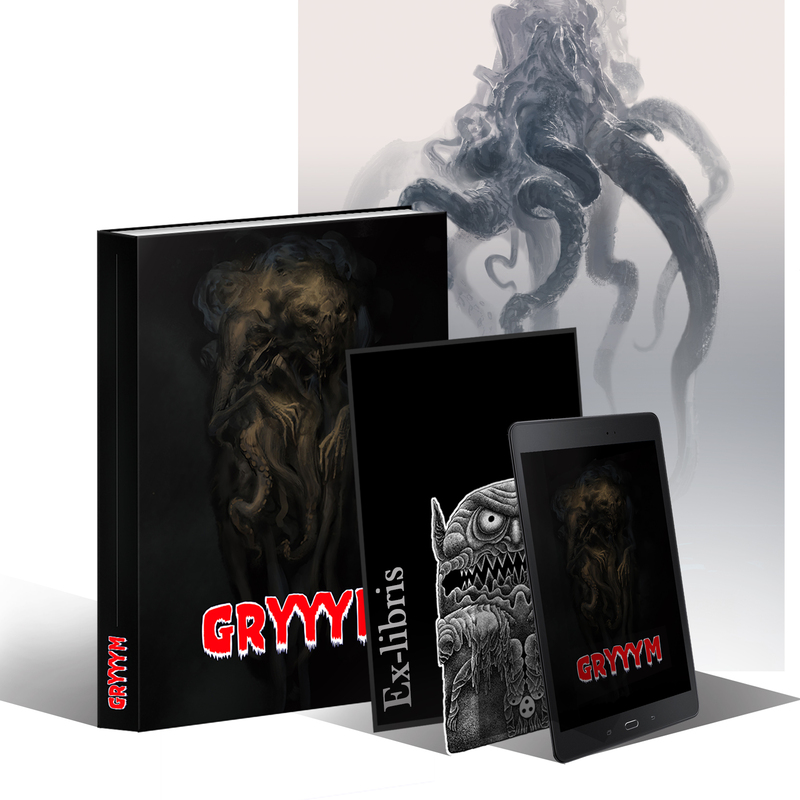 We called this great project Gryyym, in homage to the Grimm brothers, for the verb "to grim" and the meaning of "grim" (dark, sinister but also unshakeable) in English. Gryyym will be published in both French and English. The authors participating in the project are French, English, American, Italian, and Spanish. In our time, comics have never been so diverse, and the offer continues to grow every year. The publishers and the authors they embark on their adventures are constantly pushing the boundaries of expression, narrative and graphic language and reading experiences. Independent publishers and underground fanzines open up all possible avenues of subject, genre and expression. Our aim is to add an astonishing attraction to this great fairground to give the most open possible place to the imagination and to the creation of worlds of science fiction, fantasy, and horror, far from clichés, snobbisms, or passing fads. Timelessness is were we want to be. We will focus on adventure, humour, emotions, reflection, the engagement of scenarios and short stories, the density and power of drawing. 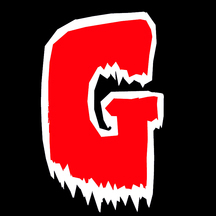 For the past year, we have been preparing Gryyym by contacting artists, authors and writers. We spent time thinking about what seemed for us to be the right format for the object you will keep in your library or on your bedside table, reading and rereading it à l'envie, in one go or in pieces. Gryyym is necessary for us. To show that there remains this element of madness and eccentricity in contemporary graphic and literary creation. This part of joy also, because these themes have always been an important part of humanity: from antiquity, through the Middle Ages, Gothic novels, fantasy classics and the beginnings of science fiction in the 19th century, its explosion in the 20th century and the birth of the modern comics. This is what will make Gryyym's richness and impertinence, nourished by such strong personalities, as well as all those who will want to join us. Gabriel Delmas is a painter and illustrator. He is the author of a number of comic book albums (Le Psychopompe, Vampyr, Le Mouton-chien penguin, Vorax...) and underground graphzines often with occult themes or dark fantasy. Some are now available from Hollow Press as Largemouths, Fobo or Plutonium. Two recent exhibitions of his work took place in Bologna, Italy in December 2016 around a giant format album Xuwwuu published by Hollow Press, and in August 2018 in Rodez featuring drawings available in the collection Riggel Bum. Joseph Lacroix is an illustrator and cartoonist. He is the author of the Encyclopedia of Evil with Gregory Makles, Pythons with Gabriel Delmas, Diablo 3, Sword of Justice with Aaron Williams, Fébus with Catmalou, part of the Book of Tyrael and other books related to Diablo or World of Warcraft as well as hundreds of drawings that are piling up, overflowing and demanding a little freedom. 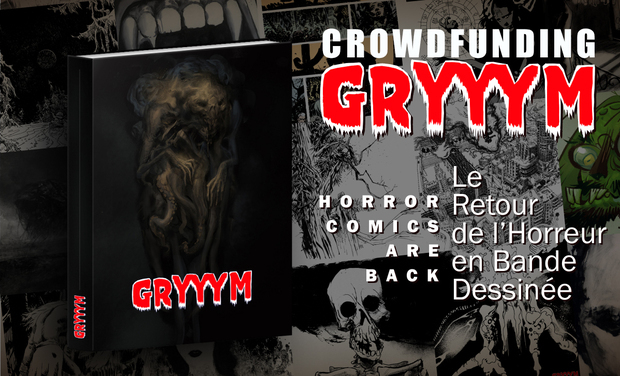 Jérôme Martineau is a comic book and press publisher, and has published many of the authors who joined the Gryyym ship with Éditions Carabas. Having worked in the press for Tournon, where he was in charge of a large number of licensed children's magazines, he is now turning to the creation of collectibles in collaboration with Marvel, Ghibli and Warhammer. From paper to 3D, the editorial experience goes on. An avid reader, he continues every week to read piles of comics, the symbiotic fluid that has been rocking his brain since childhood. It is up to him to put some order into this project and to ensure that the object you'll hold in your hands is worthy of all the hopes it has raised. He opened the way for generation of authors, mixing genres and politics, fantasy and counter culture, for over 60 years Michael Moorcock has been redefining the literature of the imagination. He was also an editor for several magazines and has collaborated with several music group or project, most notably: The Deep Fix, Hawkwind and Blue Oyster Cult. The first stage of the project is at 15,000 euros. Half of the money will go to the artists. The other half will cover the printing and shipping costs, KissKissBankBank's commission and the VAT. You run faster than a zombie? Good thing for you! In addition to the printed book (english language)+ the pdf (english language)+ 1 sticker by Julien Brunet + 1 ex-libris by Nicolas Nemiri + 1 poster by Patrick Pion + the laminated wood panel of Gryyym's cover. you'll get your very own portrait as an undead made by one of Gryyym's artists! You'll receive the original or a digital printing (if the artists works directly on his computer), size 15 x 21, and your portrait will be published inside Gryyym! Limited to the 30 quickest undead... Shipping costs included. You like zombies, good for us! Our undying gratitude for your support! Our thanks + a high-resolution PDF of the book (english language) and your name listed in the contributor page. We'll praise you to the dark gods + the book in flesh and paper (english language)+ its digital version (high-resolution pdf version in english language), and your name listed in the contributor page. Shipping costs included. EXTRA (item sold without the book): Laminated wood panel of Gryyym's cover. Size 21X28 cm, 1 cm thick. The illustration showed has been made by Patrick Pion to show the rendering of the wood panel. Shipping costs included. 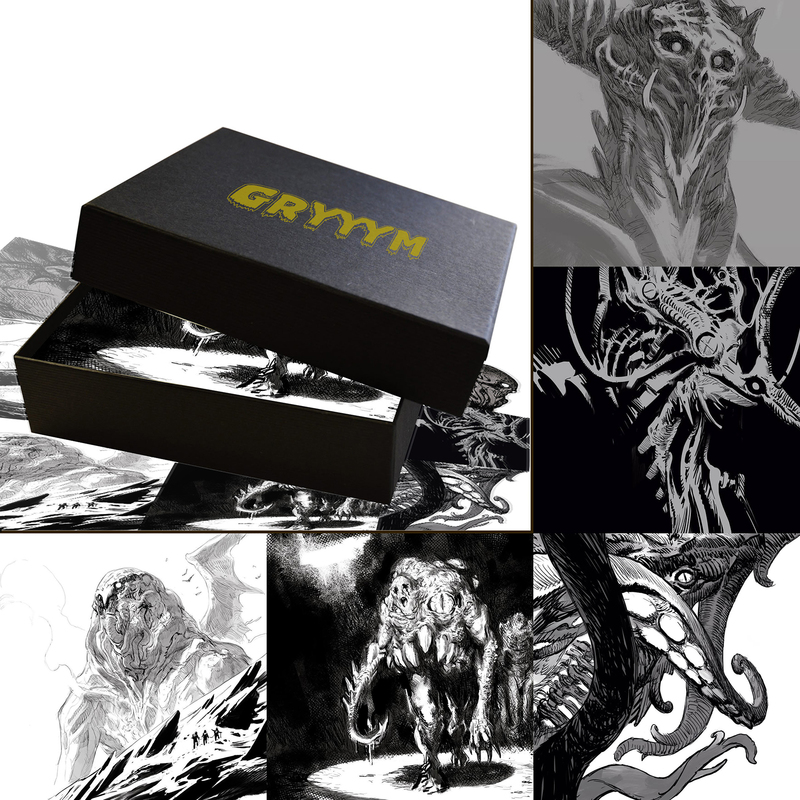 BOX COLLECTOR CTHULUH EXTRA (item sold without the book): 30 black & white cards, 12 x 12 cm, in a box. Devilishly drawn by Patrick Pion. Limited signed and numbered edition. Comes separately from the book. Shipping costs included. The printed book (english language)+ the pdf (english language)+ 1 sticker by Julien Brunet + 1 ex-libris by Nicolas Nemiri + 1 poster by Patrick Pion. And your name will be hushered to the dark god and put down in our pages. Shipping costs included. Get ready for R'lyeh! All you need for your journey in terror! Thank you all for your pledges! The printed book (english language)+ the pdf (english language)+ 1 sticker by Julien Brunet + 1 ex-libris by Nicolas Nemiri + 1 poster by Patrick Pion + the laminated wood panel of Gryyym's cover. And of course your name in the list of the sacrificed. Shipping costs included. 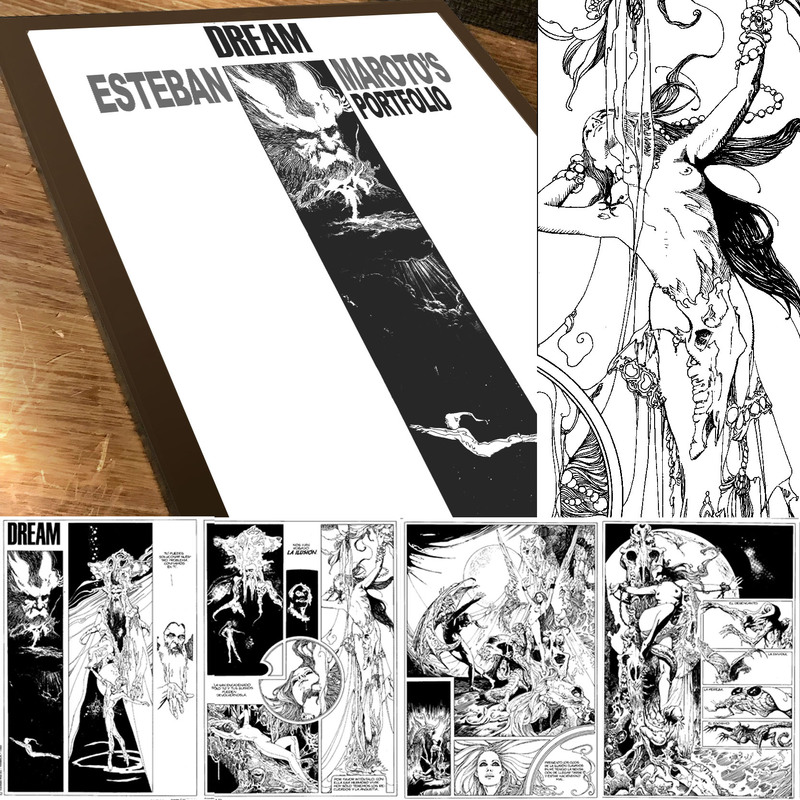 EXTRA (item sold without the book): A magnificent 30 x 41 cm Porfolio of Esteban Maroto's Gryyym story: DREAM. The 6 pages individually printed on 240 g. art paper inside! Limited and numbered edition. Comes separately from the book. Shipping costs included. All you will ever need for this ultimate descend into madness! The printed book (english language)+ the pdf (english language)+ 1 sticker by Julien Brunet + 1 ex-libris by Nicolas Nemiri + 1 poster by Patrick Pion + the laminated wood panel of Gryyym's cover + 1 original drawing at your name by Gabriel Delmas, Jean-Paul Krassinsky, Grégory Maklès, Lenté Chris and Patrick Pion ! And of course your name at the top of the sacrificed's list. Shipping costs included.